A Post Bank in twenty one words? Twenty one good words in the speech that the Prime Minister has given today at the Labour Party Conference. Our research shows there is an appetite among consumers and there are good ways (with careful logistics and some hard money) to make this happen, including links at local level with credit unions. The post office branch network, at 11,500 outlets strong, is greater than the combined total of 10,489 bank branches. There is an opportunity for rural communities here too. Only four per cent of rural areas have a bank, but 60 per cent still have a post office, meaning the post office already plays a surrogate banking role in many rural communities. The Commission for Rural Communities, for example, has found that less than 10% of all cash points are sited in rural areas, with only 46% of these being free to use (compared to just under two thirds in urban areas). New Zealand’s post office launched Kiwibank in 2002 with the offer of lower fees, better services and longer trading hours and has since become one of that country’s most popular banks. It is not a new idea. In 1861 the British government introduced the Post Office Savings Bank, which later became National Savings & Investments, followed almost a 100 years in 1968 later by Girobank. But it would be great if these words today mark the coming of age for the idea of contemporary neighbourhood banking through the Post Bank. 07.45am, off the train and it is 30 minutes to go before breakfast on consumer policy with movers and shakers and Minister Kevin Brennan. My visit to the Labour Party conference is starting earlier than my brain kicks in. Conservatives next week. Coffee now. 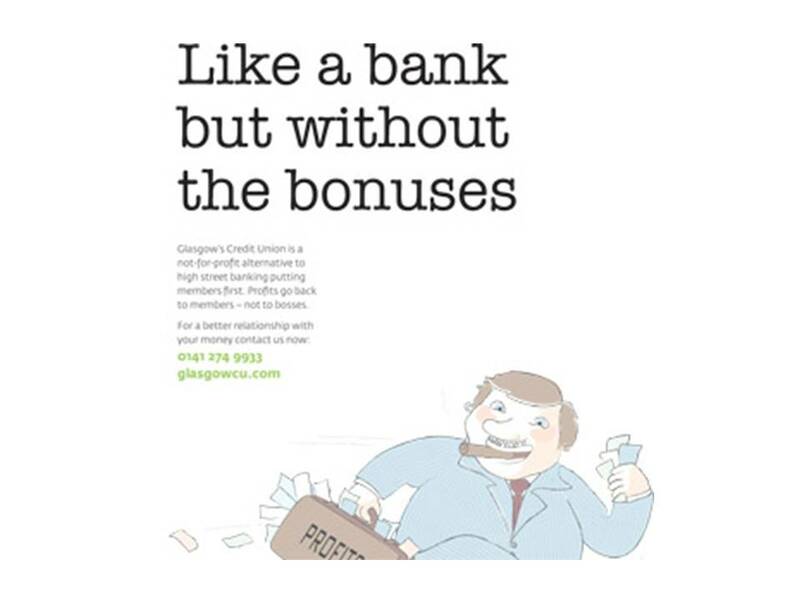 love this… an advertising campaign by Glasgow Credit Union on public transport. Last Wednesday evening, I joined a dinner for senior co-operative retailers. Neville Richardson, of the newly merged Britannia and Co-operative Financial Services, gave an inspiring talk. 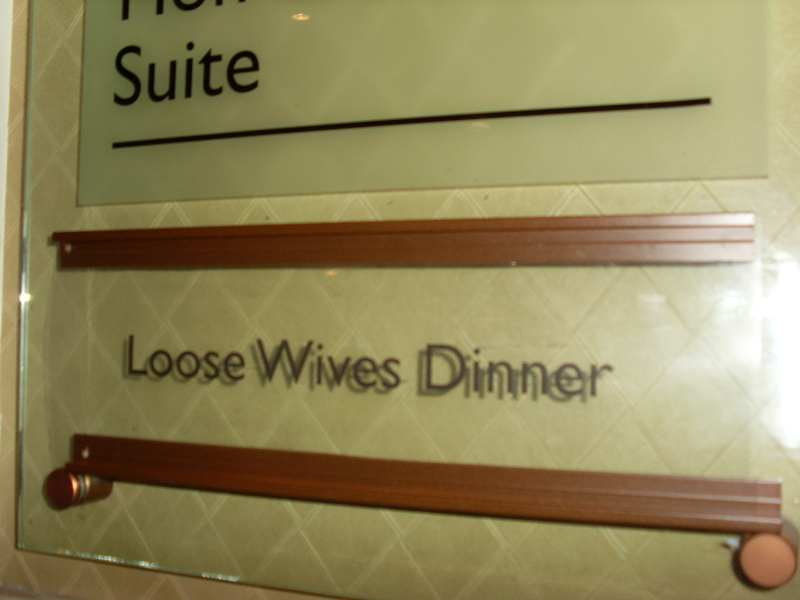 The event in the next room was intriguing – the ‘loose wives dinner’. I don’t believe we lost anyone from our room to theirs or vice-versa… but you can never be sure. It is good news that since I blogged on data sharing, we (Martin Lewis and I) have had a very constructive reply from the industry group, SCOR … and the Treasury Select Committee have announced they will run an inquiry into credit searches. Personal data increasingly has an economic value, but consumers should have some ownership of how that is used and a right to know it is not abused. As the disability movement argues, ‘nothing about us, without us’. I met up recently with Carey Oppenheim from IPPR, who is collaborating with other think tanks across the political divide on how to restore a good name to politics. Then I read the following this morning, in a second-hand copy of “Organisation” by Wilfred Brown. This is a letter from a Mr Henley MP to his constituents, published in the Shrewsbury Chronicle of 12 November 1774. They had written to ask him to oppose the Excise Bill which was before Parliament. “Gentlemen – I received yours and am surprised at your insolence in troubling me about the Excise. You know what I very well know, that I bought you, and by G… I am determined to sell you. And I know what perhaps you think I do not know, you are now selling yourselves to somebody else. And I know what you do not know, that I am buying another borough. Martin Lewis, founder of the wonderful Money Saving Expert, and I have written this week to the Standing Committee on Reciprocity, which is the club of banks and businesses that write most of the rules on who gets to see financial data about us. One of the abuses that concerns us is that if you ask a few banks how much you will be charged for a loan (the adverts after all are only indicative) in order to shop around, then that data is shared with others, who can use it to turn you down for credit, or ask you to pay more, because the last thing they want is canny consumers.